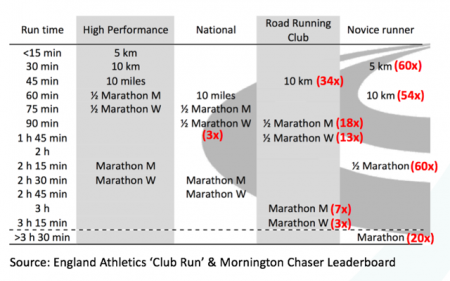 Urban Bettag coaches for the Mornington Chasers and leads the development of their track training and mentors their junior coaches. As a qualified Performance Endurance coach, accredited by UK Athletics and 10 years of experience coaching endurance runners at all levels he brings a wealth of experience to the running club. Urban can be contacted at info@runurban.com. We enjoy our weekly dosage of speed work. It feels good when we manage to get through another tough Thursday night session before the floodlights get switched off. Undoubtedly, we get a sense of achievement and want more, no matter at what pace we run. While we are still on a high and dreaming about our next running exploits, we don’t often spend much time reflecting on a training session. Wouldn’t it be nice, if we could run every week a bit faster than the previous week? If we would know what needs to be improved, most likely we would give it a go. In this week ‘Hare Brains’ blog we explain how to review a track session. Let’s go on a journey of guided discovery and revisit last Thursday track session. 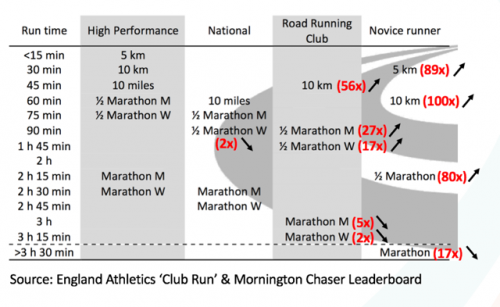 I took a sample of 4 runners and looked at their pacing and put their training session into context. Last Thursday’s coached track session consisted of sets of long and short intervals. The aim of the session was to develop speed endurance while increasing the pace throughout the session. The session serves as a ‘sharpener’ for the forthcoming 10k club championship race in Regent’s Park. The session consisted of three sets. The first set involved running 4 repetitions of 1,000 meter at 5k pace, followed by a 400 meter active recovery jog. Next, the session progressed to 4 repetitions of 400 meter at 3k pace with 45 seconds full rest. While the last set of the session, consisted of 4 repetitions of 100 meter (aka strides) at 1,500 meter (or 1 mile) pace, followed by a 100 meter walk. There was no specific recovery in between the sets. However, a 400 meter jog after the last 400 meter repetition and before the strides was possible. Breaking the total volume of the session down by running and recovery, The session covered 6,000 meters of fast running, following by 2,000 meters recoveries. More specific, 4,000 meters of 5k pace, 1,600 meters of 3k pace and 400 meters at 1,500 meters pace. In total, 8,000 meters, approx. 5 miles. For a runner with a recent 5 km time of 20:30, the recommend 5k pace for the longer intervals is 1’38’’/lap and the 3k pace for the shorter intervals is 1’34’’/lap. The focus of the 100 meter strides is more on good running form rather than accurate 1,500 meter pace. Thanks to Strava, I picked 4 runners and compared their splits. No preference on ability levels and by pure coincidence all runners are all male. Their training age is between 1 to 3 years. For the last 4 weeks, Runner A has average 69 km (43 miles) per week, Runner B 24 km (15 miles) per week, Runner C 41 km (25 miles) and Runner D 46km (28 miles) per week. 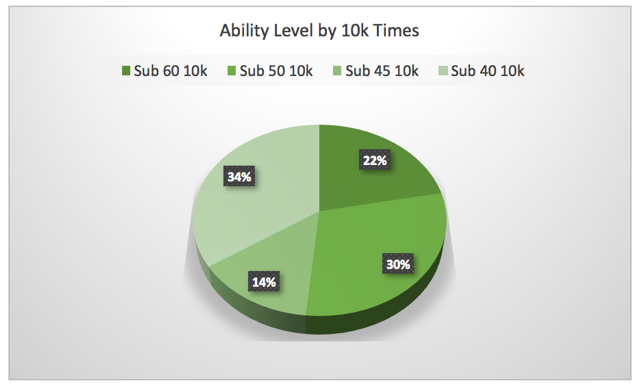 However, we can apply the same analysis for runners at all abilities. Let’s assume that each of the runners could always run a tad faster. For example, when the track is very crowded we have to spend a bit more time overtaking and lose the odd second. Others constantly worry about their pace and look every 10 seconds at their watch and check if they are still on pace. This extra effort takes time. Sometimes the weather is against us and it is very windy. Finally, some always run in lane 2 around the track, covering more distance. Regardless, let’s not make excuses and simply look at the data. First, we want to determine the average pace for the 1,000m / 400m, i.e. their 5k and 3k pace. Putting the runner’s average training paces into context with the splits we can see that Runner A and D started a bit too fast initially for the first 1000 meter. In contrast, Runner B started more conservative and upped the pace throughout the 1000s, while Runner C maintained the pace after a fast opening 1000 meter. Runner D did the same session off track and attributed the strong headwind for a change in pace. Looking at the deviation from the average splits. Runners A, B and C fastest and slowest deviated up to 4 and 5 seconds from their average training pace. Approx. 2% to the time of the repetition. Overall, the training session was well executed. Ideally, we aspire towards consistency in pacing and aim to target the 5k intensity for the longer and 3k intensity for the shorter repetitions. If we are +/- 1 to 2 seconds. A high level of concentration and focus is required to achieve consistent pacing. When we are not focussed or not engaged in the task ahead, then we will not be able to perform at our best. After the session, Runner B asked me about cadence. Cadence is important. Running 180 strides per minute (spm) is an excellent guide. Typically, when runners overstride, they achieve a lower number. 180 spm is on balance a good number with stride length and ground contact time at their optimum. The shorter the stride the higher cadence, though the pace might drop at some stage as it turned out to be difficult to maintain a higher cadence than 180. Alternatively, the longer the stride and the higher the cadence, the more ground we can cover and the better the pace. There is an optimal point for each runner when cadence, pace, stride length and ground contact time are in balance. Maintaining good running form is important. Having a good running rhythm and running relaxed will help us to get more out of every stride. Upper body posture, looking ahead, good arm drive and running with the pelvis in a neutral position will help us running more efficiently. Runner A and C are of similar ability, while Runner B is a tad slower. Runner A has a recent 5k time of 19’30’’, while Runner B and C don’t have a 5k time yet. In fact, Runner A managed to set a new PB in the next parkrun and ran 19’00’’. Runner B and C both have only a 10k time, Runner B would be around 22’00’’ for the 5k and Runner C around 24’00’’, though Runner C can run much faster. However, let’s not speculate, Runner B and C should test themselves in a parkrun and put their 5k race time in context to their training time. From a runner’s perspective, it can be quite confusing to work out the different paces. However, those of you, who train on the tack on a regular basis and monitor your training paces notice that depending on the distance, paces can vary. For example, we all can do a quick 200 meter. However, when it comes to maintaining the same pace for a 400 meter we struggle to maintain the pace. Same applies when we run a swift 400 meter. It would leave us exhausted for 800 meters. Frank Horwill MBE, a British Distance Coaching guru, spotted that there is a relationship between those paces. Horwill came up with the ‘Four-Second Rule’, which says. Whenever one doubles the distance, the pace per laps increases by 4 seconds. This rule becomes useful whenever we try to identify training paces up / down from the 5k event. For example, for our runner with a 5km time of 20:30 the 5k pace is 1’38’’ per lap. 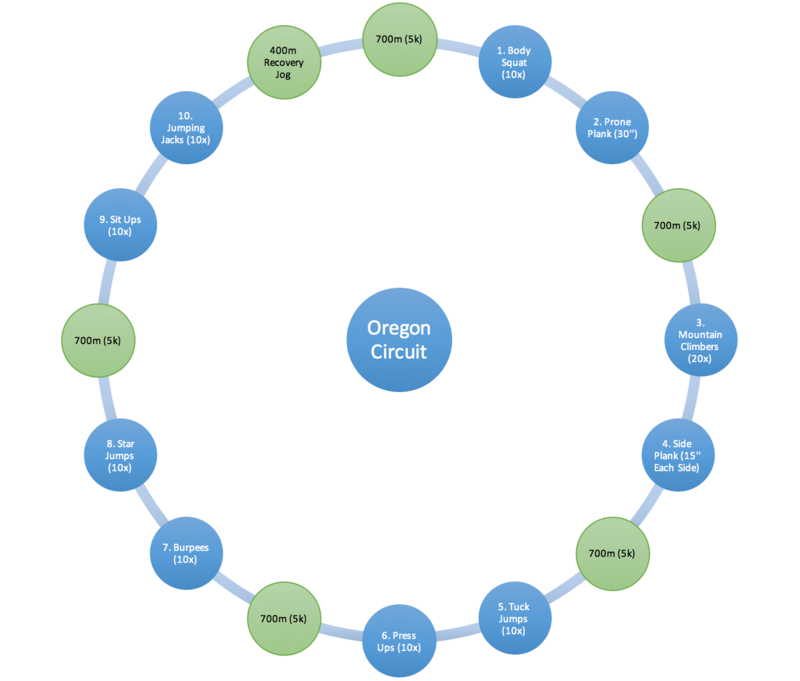 If we train for the next classic distance down from the 5k, the 3k race paces would be 1’34’’ lap. On the other hand, if we run repetitions at 10k pace, then the recommended 10k pace would be 1’42’’. However, keep in mind, it is not an axiom, the ‘Four-Second Rule’ provides a useful guide especially for the shorter distances and training for the track. Predicting half marathon and marathon paces from a 5k time may only work for well-trained athletes. Let’s apply the ‘Four Second Rule’ for the 5k and 3k paces for our 3 runners. As we can the ‘Four Second Rule’ would be more a 7 second rule. We can assume that the formula applies to very well trained and experienced track athletes. A slight modification applies for improvers. Certainly, for Runners A, B and C a good start for next week’s session would be to apply their achieved average paces as a starting pace and improve throughout the session. Acquiring the skill of pacing is best explained using the Conscious Competency Model. Noel Burch developed the Conscious Competency Model in the 1970s. The model helps us to describe our learning journey from becoming conscious (i.e. being aware) and competent, being proficient and knowledgeable about something. When we learn a new skill, we are unconsciously incompetent. We don’t know what to look out for and we cannot see and understand the how to apply the skill. We lack awareness and knowledge. Once we increase our awareness about the new skills we try to learn and understand some of the nuances, then we become consciously incompetent. We understand that there is something required to apply the skill, though we still don’t fully get it yet and don’t know what to do about it. We have not received the full set of instructions on how to fix the problem through applying the new skill. Next, even once we have an idea or have been given the instructions how to tackle the problem we start to become consciously competent. At this stage, we have developed the competency, though it still requires an amount of effort to apply the instructions. When consciously competent learning continues through feedback to strive for mastery. For runners, getting to this stage is important as learning and adapting throughout the season, like any other sport is an essential skill to have as an improving runner. If we train the same, we stay the same. Ultimately, through a lot of practice, we become unconsciously competent. We don’t have to think too hard about applying a skill, intuitively we do it the right way and have developed mastery in the skill. When we are new to interval training and track sessions, we are perhaps overconfident, set off too quickly as we have don’t understand how to pace and the physiological changes the body goes through when running. We are unconsciously incompetent. We have not developed the awareness and the knowledge how to train. After some feedback and a lot of training, we got pretty good at running fast. Through more feedback and reflection we have developed a better awareness of the various pacing intensities. Through an increase in knowledge about the training, we developed a good understanding and started to be proficient about pacing. With a further practice and more feedback eventually, we reach a point of mastery. 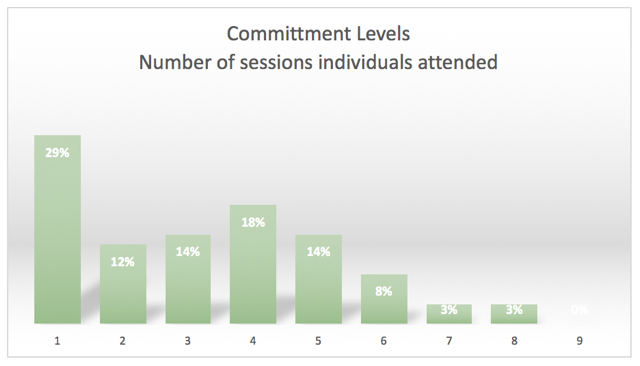 In most of the sessions, your pacing is spot on. You experienced improvement in your running on and off the track. Going through this learning cycle is important. Only once we have explored and understood the problem of pacing, then we can develop tactics for improvement. Runners will most likely only make those right actions, once they have developed the awareness or a coach has guided through questions/answering. A retrospective is a good way for individuals to pause, take stock and reflect on how their progress has been. Retrospectives have been introduced by the therapist Virgina Satir in a family therapy setting. However, the underpinning principle is universal. The essence of the method is first reflecting on what has happened in the past (both positive and negative) and then deciding on what to do in the future to improve. Those self-reflections help identify potential areas for improvements. A regular retrospective helps individuals to improve their performance. Discuss the outcomes of a self-reflection with friends, fellow runners or coaches. What do I commit to improving? Spending 5 to 10 minutes and making a couple of notes is all that it takes. Once a month, look back through your notes and see where you are and how you are progressing. It is worth considering to have relevant training data at hand, which will avoid stating opinions and getting locked. Don’t go through a retrospective not too frequently. Otherwise, a retrospective can be rushed and become routine. Analysis and reflections need time. Often when we see various points in front of us, we can better relate them and come up with better options to resolve them. As we learned from one of the previous blogs on the Inner Game. You will be more likely learn and improve if you develop an awareness of your strength and weaknesses. We asked one of the runners to provide feedback based on the questions mentioned in the previous section. Breaking out from work early afternoon and doing it by myself. Deciding to do the intervals along Embankment (mostly on the cycle-path) was good as essentially flat and no obstacles – as close to track conditions as possible. Hitting a rhythm over the last couple of 1ks and a more powerful ones in the 400ms. Maintained energy and speed over entire session, unlike last week when suffered over the last 1,600m. Ideally, do this on the track with others, but work commitments will occasionally get in the way. 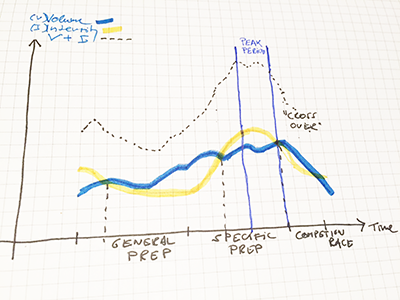 Ease back on the pacing; I was too quick compared to the pacing from last week’s session. I have a strong feeling that I’ve already become quicker though. As I set distances/rest times on my watch, the rest/jog/walks during the transition between 1ks, 400ms, 100ms was slightly longer than planned as was reconfiguring watch. Sort out how strides should work; build up over 30m, accelerate over 30m, ease back over 30m. For an interval session away from the track, this was a good effort. Perhaps a slightly longer warm-up next time, with a few more strides to warm up the body better for the first interval. Focus in on getting the acceleration/deceleration on strides spot on. I’ll be following the winter schedule, and should make it to the track. Recalculate 5k/3k pacing based on this session, and follow the pacing strategy/strides profile better than this week. 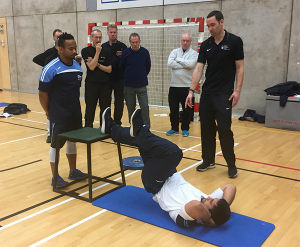 The retrospective highlighted raised awareness regarding practising pacing in training. It worked well for the runner to create his conducive environment by adapting a track session to the road. In a next session, the athlete will keep a closer look at his pacing and will approach the next training unit with more discipline. To get out more of your weekly track session, make sure you arrive prepared at the track and know how to determine your training paces. Horwill’s 4-Second Rule provides an easy way to determine 3k and 10k paces based on a recent 5k performance. In doubt, the pace calculator on the Mornington Chaser website can do the calculation for you. While it is important to practise pacing in training, it is equally important to practice pacing in a race. When going into a race, runners need to have confidence in their ability and need to apply a race strategy. Revisiting your training paces will provide you with a good starting point for your target race pace. When asked what is the best piece of advice former British running legend Ron Hill could give to any up and coming runners. His answer was to keep a training log. The training log provides an opportunity to go back and check what you have done before and what tweaks you have applied to your training. It’s an important record to facilitate your learning. Technology can assist runners when it comes capture data, though there still is a need for analysis, retrospective and reflection. When we skip this phase, we risk of missing out a valuable learning opportunity. Don’t be afraid to make changes to your training. If something doesn’t work out for you, then there is no point making the same mistakes over and over again. 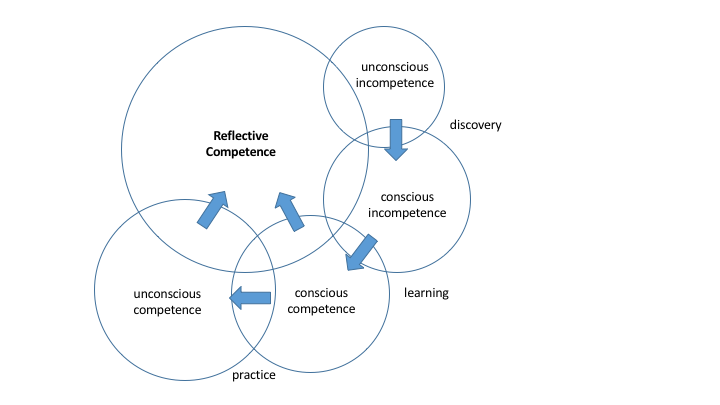 Self-reflection is a good start turning a training experience into a learning opportunity. Self-assessment is the first step towards improvement. Ask yourself what works well for you, what does not work so well and what could you do to improve and what changes are you willing to commit. We all have done interval sessions with full or active recoveries. In this week’s blog, we want to explore the concept of active recoveries a bit more. Last week, I received an invite from Dr Matt Long to join his Facebook group ‘BUAC (Birmingham University Athletics Club) – Education & Resources’. Matt posted a short video showing BUAC athletes during their recoveries. Some were standing, others were jogging during their recoveries. Matt asked which athlete would you rather be? The athlete who is resting or the other one jogging during the recovery. 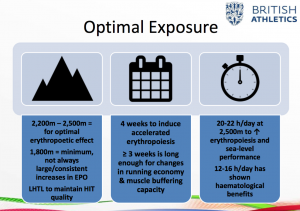 Considering the amount of interval training sessions we have done I thought, this would be worthwhile a ‘Hare Brains’ blog post. To better understand what is going on physiologically and psychologically within an interval session we have to revisit its parts and intended purpose before we can draw conclusions on what type of recoveries work best in which circumstances and how athletes can benefit from active recoveries. The terms repetition and interval training are often used interchangeably for anything speedwork related. However, there are subtle differences between both methods of training. Like most quality running sessions, a session consists of hard running (repetitions) for a set distance/time followed by jogging or a pause (interval). When referring to ‘repetition’, we mean the part of actively running, while the interval, is the pause between repetitions. Depending on the training emphasis, interval and repetition training have different aims. During a repetition session bouts of fast running can be run faster at race pace for set distance or time. The focus is on what happens within the repetition, e.g. how fast to run. The time between repetitions can be several minutes or whatever time it takes to be able to run the next repeat at high intensity. For example, 4x 400m (800m Race Pace) [7’ Rest], 4 repetitions of 400m at 800m race pace followed by 7 minutes rest. Interval training, on the other hand, focusses more on what happens in between the repetitions, while the pace/speed of the repetitions is less strict. Interval training is used with shorter repetitions to promote greater heart stroke volume. An interval session 12x 400m (5k) [1’20’’ ’active jog recovery], 12 repetitions of 400m at 5k race pace followed by a jog for 1’20’’. Important to remember that interval training is a kind of repetition training. However, not all forms of repetition training are interval training. During Thursday track sessions we have practiced active and full recoveries. For example, a lap of jogging after 4x 1km or a 45’’ full recovery after 400m. By full recovery, we mean rest, the athlete tries to speed up recovery by waiting between intervals and reduce the heart rate as quickly as possible towards 120 beats per minute (bpm). An active, jogging recovery, once finished with a repetition the athlete would continue and jog during the recovery period. The heart rate reduces slowly, though will unlikely hit the same levels in comparison to the full recovery. While running at a lower heart rate during recovery, physiologically, the heart expands and pumps volumes of blood around and gets strengthened. Lactate – Friend of foe? When we train on the track and push hard throughout the session, we experience a sensation of exhaustion, tiredness, fatigue and soreness. In contrast, when we go for an easy run we finish with a feeling of being energised and able to run further. Depending on our pace, we have to fuel the body with energy. When running slow, we use glycogen stored in the muscle and fat. When going faster, we shift the fuel mix and increase the amount of muscle glycogen and lower the portion of fat as fuel. When athletes get asked what is going on, often athletes refer to ‘lactic acid’ started to build, a burning sensation in their muscles, preventing them maintaining the pace. The common perception is that lactic acid is not good for you. The truth is the human body does not produce ‘lactic acid’. As a by-product during running, the body produces only lactate and not the acid form. Lactate is a source of fuel (for muscles) and good for you. The amount of lactate created depends on the exercise intensity and running speed. When running slow, we produce small amounts of lactate, which the body recycles as fuel for the muscles. When running fast (i.e. min 80% of maximum heart rate), we produce more lactate. When lactate becomes available, it can be recycled and contrary to common belief can help to delay fatigue and serve as a fuel for muscles. To take advantage of this fuel, when we start to produce lactate, we can recycle lactate into fuel when we shuttle the lactate around the legs and feed the muscles. To maximise performance, either improve the rate of recycling lactate or a reduce the production of lactate at higher speeds. The concept of active recoveries has been around for years. Initially, I came across when I read an article from Peter Thompson on the New Interval training, which explains the physiological side between classic and new interval training with active recoveries. Thompson refers to this form of training lactate dynamics training. Thompson suggests converting most traditional interval training sessions into a new interval session (aka lactate dynamics session). For example, 12x 400m (5k) (1’ Rest) becomes 12x 400m (5k) (200m Active Recovery Jog) or even better 3x 4x 400m (5k) (200m Active Recovery Jog)(400m Jog in between sets). By making the interval more active the heart rate will come down more slowly during the interval, though stays higher in comparison to full rest, body promotes the lactate shuttle and enables athletes to spend more time their maximum oxygen uptake. While there is certain strength and training age required to make it through a 6k-8k training session with active recoveries, those new to sessions can incorporate walking recoveries, reduce the session volume and slowly progress their active recoveries over a few weeks. Important, many runners run their repetition too hard and end up running the reps at their best race effort rather than their form on the day. In all sessions we do we refer to the most recent 3k, 5k or 10k pace, not your lifetime best pace for 4k, 5k or 10k. Further, we have to put the interval session into the wider context of the season. Fitness and form will progress and so will your training paces through consistent practice. The concept of bouts of fast running followed by relaxed running over varying distances is also known as Fartlek, Fartlek is a Swedish term for ‘fart’ (speed) and ‘lek’ (play), roughly ‘fartlek’ translates to ‘speed-play’. As the name suggests, a more playful, less rigid and structured approach to speed development. Former Swedish decathlete and cross-country coach Göta Holmér introduced the Fartlek training method in 1937. At the time Paavo Nurmi dominated long distance running and Holmér had to find a new approach to improve the Sweden’s XC team performance against the ‘Flying Finns’. Developing speed endurance, through running short bouts at faster than race pace speeds with good running rhythm followed by easy running as part of a longer run proved to be effective. Fartlek training improves speed, stamina, running economy and endurance. Holmér most famous proteges were Gunder Hägg and Arne Andersson. Hägg was the first athlete to break 14 mins (13:58.2) for the 5,000m and his 4:01.4 for the mile was a world record at the time, which was broken 9 years later by Roger Bannister. A typical fartlek session according to Holmér is 8-9 miles long which incorporates a 3 mile of fartlek in a natural setting. For example, for Hägg’s 4’01” mile (race pace), a (structured) fartlek session a la Holmér during his peak period could have been 24x 200m (mile pace) [200m active recovery], or time-based 24x 30” (mile pace) [~50” active recovery]. To get a full session, embed the fartlek in a 25′ warm-up and 25′ cool-down. Something for you to try out on a Tuesday Night. Remember, a traditional Fartlek session is unstructured, and the athlete chooses intuitively, spontaneously for how long and how fast the bouts of intense and relaxed running are. The active recoveries in between the bouts of fast running will help to refuel the muscle with lactate. This session can be done on undulating terrain and can be run individually or in a group. One could do an experiment, run a session of 4x 1,200m [5k] (3’) with full and active recoveries by wearing the heart rate monitor. During full recoveries, well-trained athlete’s heart rate will quickly drop towards 120 bpm and even further. Typically, athletes spend the first 200m into the 1,200m repetition, bringing the heart rate quickly up towards 95% of their maximum HR and try to maintain the heart rate at that level for the duration of the repetition. When applying active recoveries, the heart rate never drops to 120 bpm (more likely 140 bpm). As a consequence, when starting the first repetition, less time is required to reach 95% of maximum HR again. For example, athletes reach their effective heart rate sooner, already 50 meters into the session. If we add up the additional gain of training at 95% maximum heart rate for each repetition, we will end up with a total quality training time at 95% of max. HR, which could provide a greater training stimulus. If we all add up those gains for each repetition when applying active recoveries, then athletes can get more out of the session in comparison with an interval session based on full recoveries. In an interview on BUAC, British coaching legend, Bud Baldaro made an interesting observation. In most races there is no walking involved, active recoveries mimic a race situation and keep the athlete engaged in the session. The focus remains on running. When standing still, the mind quickly fades, gets distracted, lose focus and concentration. It is desirable to take advantage of the lactate shuttle and apply active recoveries during an interval session. However, as pointed out it depends on the training and biological age of the athletes. Those with a few years training age can handle the intensity and have the aerobic capacity to apply jog recoveries, while a beginner may struggle, though a walking recovery is a good alternative as well. Next time you train on the track, don’t beat yourself up when you have not hit your target pace, rather focus on the active recoveries and the training benefits it will have for you. Beyond the detail of a quality training session, there must be a wider, more holistic view regarding what Is involved in good running performance. In sports, there is a commonly known model for understanding ‘performance’ and what factors contribute to a good performance. You don’t have to be on lottery funding to have a view about your own performance. For ourselves and circumstances vary, we can always improve through reflecting on our own performance. The common factors contributing to performance are physical, psychological, tactical, technical and lifestyle. You may think of age, speed, strength, etc. these are all relevant, though these are all examples of physical factors. There is no specific factor more important than the other. For example, you could be (physically) well trained, but perform (tactically) poor in races. Hence, it’s the sum of the parts which maximises your overall performance. While I will not be able to influence on lifestyle choices, we can always develop all other 4 performance factors. During training, we touch on physical, tactical and technical, but often neglect psychological aspects. For example, when we had a busy day at work and start to train in a tired state we cannot be our best. On the other hand, we could feel fatigued, but feel positive about running. Once we develop a bit of awareness of the performance factors, then we can find something we can improve and get a bit extra. Looking at performance from a psychological point of view, we can think of the 4 Cs of Sports Psychology – Concentration, Confidence, Control, and Commitment. All very important, and again the sum of the parts gets the most out of you. For example concentration. This is best achieved by focusing on the task ahead. When we perform a set of running form drills we need to fully concentrate so that we can execute the movement and can ensure the nerves fire at the right time and our muscles are working. For the running part of the session, rather than thinking about the whole session and getting overwhelmed, look forward to just completing the interval and start to worry about the next one once you finished the previous one. Alternatively, you want to maintain concentration by thinking through how many straights and bends do I need to over, when should I concentrate on my form? Often we give a lot of effort and ignore running form. When it gets tough going give yourself a mental cue (‘hips!’,’knees!’) to what to watch out for. As a last resort, some positive re-affirmation helps to bounce back. Mental tricks the best runners apply during their bone breaking workouts. Try running with a smile on your face next time, you may surprise yourself. In sports psychology, one of the earliest writing came from Timothy Gallwey. Gallwey wrote a book called The Inner Game of Golf, which was followed up by The Inner Game of Tennis. He studied many golf players and worked out the things they do to perfect their game. His findings were that to maximise performance and grow potential, what most folks aspire towards, one has to cut out interference. For example, assumptions and believes can get in the way how we perform. As mentioned earlier, my parkrun buddy Ed, who believes he has to start fast, doubts about his pacing and lack of finishing kick. Unless he has developed the awareness and the required concentration of what he is doing, he will not be able to apply possible instructions to minimise interference and improve on his potential. There are certain thought processes to go through beyond just looking at the track session details. Next time you train to give it a try, reflect on your performance factors, revisit the 4Cs, minimise any interference and you may discover that there is an inner hare lurking in you. To find your inner hare, there is a lot you can do, which is in your control. When I observe and watch you running, I don’t give a lot of attention to the stop watch, rather I am looking at the whole how you progress through the session, how you apply yourself, how your performance factors develop over time, how well you apply the 4Cs and how well have you executed the session? Back to my nemesis Ed, who I mentioned at the beginning of the week. We recently took a break and decided to do the Great Gorilla Run (5m). Same story again, during the 6th km I was closing fast, Ed was 20 meters ahead, and I was on auto pilot for the last 400m etc. Unfortunately, my game plan didn’t work out! The race was 600m short, Ed finished a few seconds ahead of me. Lesson learnt, do your research, know the course and don’t always rely on your GPS watch.